Pedro Zerbini teamed with fellow senior Jonathan Dahan in doubles for an 8-2 win. The No. 17 player in the country, Zerbini came from behind on Tuesday to beat San Diego's Dean Jackson in singles, 3-6, 6-3, 1-0(8). To be a sore loser after a particularly brutal battle might not be exalted, but at least it's expected. To be an enraged loser is another story. 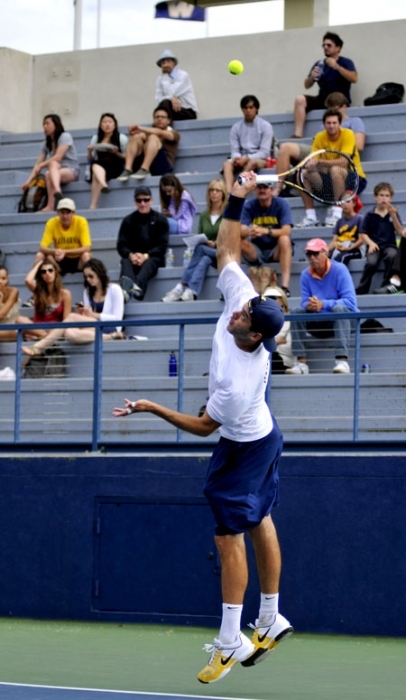 Dean Jackson of San Diego was the second type of loser by the end of Tuesday's match against the No. 10 Cal men's tennis team at the Hellman Tennis Complex. After falling to Bears senior captain Pedro Zerbini, 3-6, 6-3, 1-0(8), Jackson hurled his racket into the net, shouted a few choice expletives at both the surrounding crowd and the ground and then kicked his cup of Gatorade - onto his own bag. Perhaps Jackson's actions were warranted, though; even if he had won his match, it wouldn't have mattered. After nabbing the doubles point and taking three of the first four singles courts, Cal defeated the Toreros, 6-1, in its last home match of the regular season. While Bears coach Peter Wright said prior to the match that San Diego (15-4, 1-1 in the WCC) would be a challenging team, he never grew worried or doubtful of his squad's ability throughout the bout. "I was never really thinking of the score," he said. "I look more at how the guys play. I wasn't concerned with the outcome when I saw the narrowness of their focus." Cal (11-5, 2-1 in the Pac-10) dominated the doubles round by sweeping all three courts in 1-2-3 succession. The No. 22 tandem of junior Nick Andrews and Christoffer Konigsfeldt clinched its 8-3 victory over Nikola Bubnic and Nils Schive when Andrews returned the ball straight into the left corner. The senior duo of Zerbini and Jonathan Dahan - who got the chance to play for the first time in the dual season - finished next on court No. 2, while freshman Ben McLachlan and his sophomore brother Riki snatched an 8-4 decision on the third court. Then came Zerbini and Jackson's clash on the top court. After injuring his foot during the first few points, Zerbini lacked his usual decisive speed and agility at the start of the first set. "I tweaked it, a bone bruise or whatever," he said. "But I tried to use it as motivation. I wasn't at my best but I still had to perform. You kind of put aside the injury when that happens." While Jackson's emotion got the best of him by the end, Zerbini used his own pent-up frustration to his advantage. "Pedro has such a fiery spirit," Wright said. "He always has his eye on the target, but sometimes his emotions bubble up. It hurts him to get too emotional, but he can also use it as motivation." Zerbini yelled at the judge and threw his racket after multiple line disputes, but he successfully made Jackson dance around the court until the points worked out in his favor. "My nerves were kicking in, but I was able to control them in the end and close it out," Zerbini said. Zerbini's match may have been the most heated, but it was not Cal's final win of the day. Fellow senior Bozhidar Katsarov earned that distinction. The Bulgaria native had an early trade-off with Nils Schive in the second set before breaking away to win the contest, 6-4, 6-4. "The seniors were undefeated on Senior Day," Wright said. "Seeing them perform at that level, that's what it's all about."